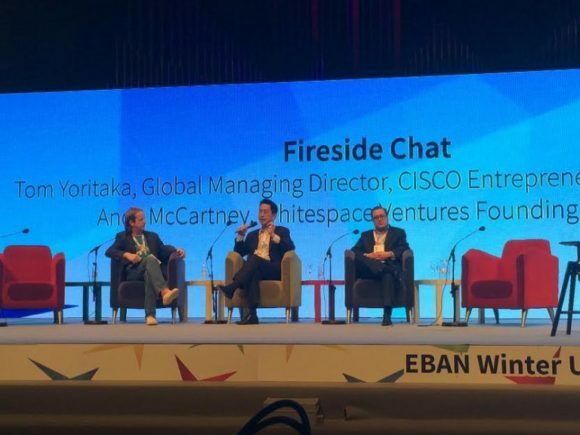 On 28-30 November, more than 1,000 attendees from all over the world gathered in Zagreb, Croatia, for three days of celebrating entrepreneurship and angel investing at the EBAN Winter University. Guests of the event included angel investors, entrepreneurs, corporates, politicians, accelerators, incubators, crowd funders and even rock stars! 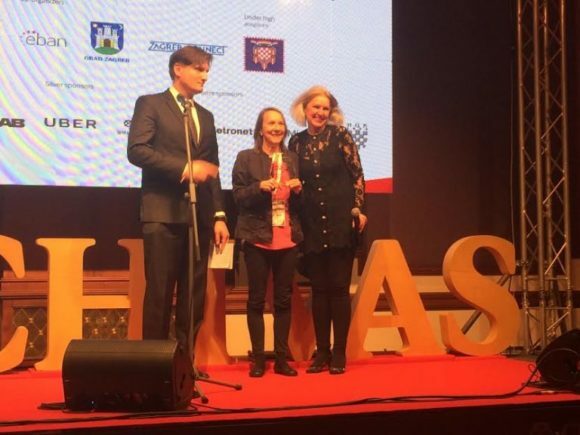 We were thrilled to work with our co-organizers from CRANE, the Croatian Business Angels Network, and its President Davorin Stetner, and to enjoy the patronage of Her Excellency, Kolinda Grabar – Kitarović, the President of Croatia and the generous hosting of Milan Bandić, the Mayor of Zagreb. 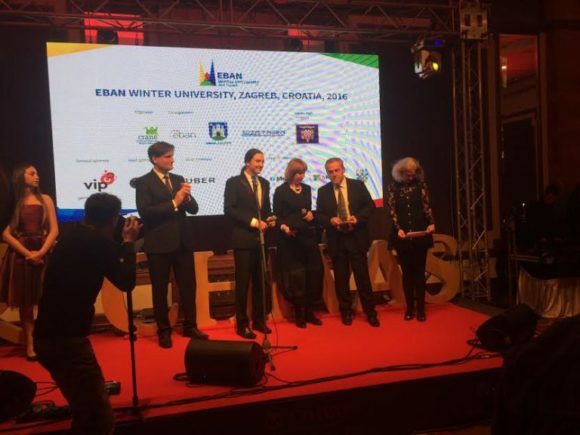 This year’s EBAN Winter University focused on building the entrepreneurial mindset in Croatia and the CEE region. 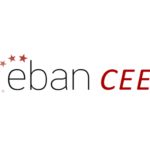 For EBAN, the CEE countries of Europe are where the future lies with world-class, creative entrepreneurs and business angels who recognize the importance of banding together with their CEE Compatriots to build innovative companies which can scale across the whole region, Europe and the world. 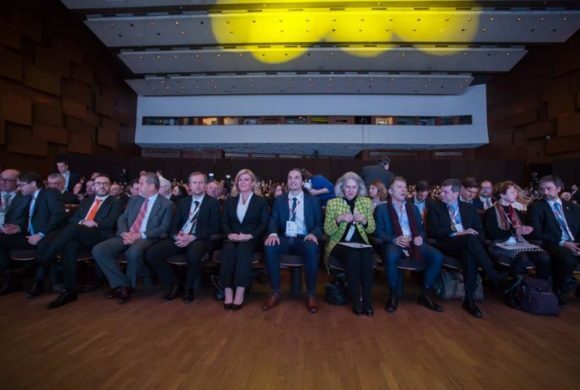 The conference was opened by two amazing keynote speeches from the President of Croatia – Kolinda Grabar-Kitarović – and rock legend turned pilot turned successful entrepreneur – Bruce Dickinson. The President spoke about the importance of entrepreneurs and startups in creating jobs and economic growth, as well as the importance of gender balance in innovative fields and companies, which is something that is close to EBAN’s heart – as we are closely involved with the Rising Tide initiative, which was also featured prominently at the Winter University. Next up we had a Rockstar performance from the legend himself – Bruce Dickinson of Iron Maiden, who has founded multiple successful ventures despite having already achieved great success in the music industry and being an airline pilot on top of everything else! He gave an inspiring speech on the amazing things one can achieve when following one’s instincts and chasing after the craziest of ideas. Following the explosive opening, the conference got off to a great start with the “Governments are Game Changers” panel, moderated by Tom Tyler from Bloomberg and featuring Mark Begich, former US Senator and Mayor from Alaska; Martina Dalić, Deputy Prime Minister of Croatia and Minister of Economy, Small and Medium Entrepreneurship and Crafts, and Ann-Kristin Adolfsson from the SAAB group. The panelists emphasized the importance of transparency both in politics and private enterprise as a way of gaining trust and achieving success. Following the discussion of how politics affects entrepreneurship and investment, four greatly successful angel investors – Johann Hansmann, Peter Cowley, Peter Jungen and Dr. Alicia Robb – shared their knowledge and experience in the “Super Secrets from Super Angels” panel, moderated by CRANE Board Member Saša Cvetojević. The audience got to hear how they became successful by angel investing, what their investment criteria are, and how they stay on top of the latest trends in innovation. Next up was advice from entrepreneurs who have already been through it all – Sandro Mur of Bellabeat, Damir Sabol of Photomath, Luka Abrus of Shoutem/Five, and Avil Marcel Kazstan of Sixgil shared their success stories and advice in the panel moderated by NYC startup attorney Mauro Viskovic on “how to scale globally”, providing hopeful entrepreneurs with a lot of great advice on how to achieve global success. The success stories did not stop there – the next keynote speech came from Dov Moran, whose invention changed the way we transfer files throughout the world. The inventor of the USB stick gave an inspiring speech about how many failed enterprises usually stand behind great success and emphasized that no one is immune to failure, even after achieving great success. Next up was Esther Dyson, a trained cosmonaut and pioneer angel investor, who came all the way from the United States to attend EBAN Winter University and share her vast knowledge and experience. Being focused on investing in Space ventures, among other sectors, Esther Dyson was an inspiration, even making the idea of retirement exciting by sharing that she plans to spend her last years on Mars! The discussion on space continued, moderated by Selma Prodavonic of the Austrian Angel Investors Association with a panel which also featured Martin Mössler, from the European Space Agency and Allyson Reneau from NASA. The panel clearly showed how space is truly the final frontier for startups and angel investors and that investing in the sector is an unmissable opportunity. The Winter University was also EBAN’s first opportunity to welcome Tom Yoritaka and Jonathan Costello from the Cisco Entrepreneurs in Residence program, who, together with Andy McCartney from Whitespace Ventures, held an extremely interesting talk on their program on 29 November, in addition to a workshop for entrepreneurs and investors the day before which focused on communicating value and led by inspirational speaker Paul Lanigan. The Cisco “Entrepreneurs in Residence” is a startup development program that focuses on some of the most important technological trends of our time – find out more about the program here! The first day of the conference finished with an announcement for the 2017 EBAN Annual Congress, which will take place in Malaga, Spain, on 7-9 June, with a special video from Francisco de la Torre Prados, the Mayor of Malaga. EBAN is already looking forward to planning this next conference with even more groundbreaking discussions and inspirational speakers! 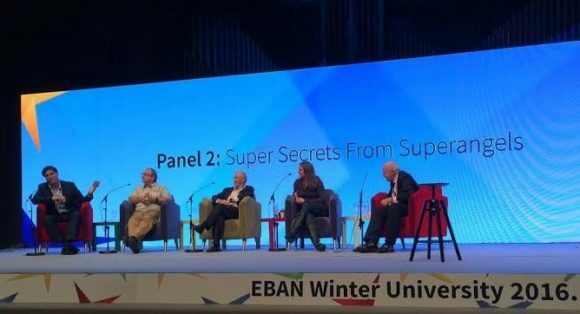 Entrepreneurs took center stage throughout all three days of the EBAN Winter University with special training activities, pitching sessions and workshops. Under the scope of Training, Coaching and Demo Day on 28 November, EBAN organised a set of activities focused on entrepreneurs, including coaching workshops, one-to-one meetings with investors and elevator pitch dry-runs as part of the InvestHorizon project. The grand finale of the day was the Global Investment Forum, where startups had the chance to pitch to an audience of more than 50 active investors, equipped with advice and a better understanding of pitching best practices. 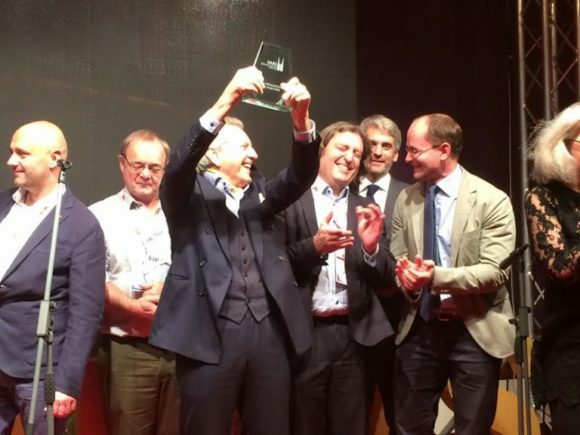 We are also delighted to announce that Syneidis, the winner of the Global Investor Forum, is a cyber security startup backed by both ICEX and ESA. On 29-30 November, the entrepreneurs took their pitches to an even larger audience at the Winter University Conference. 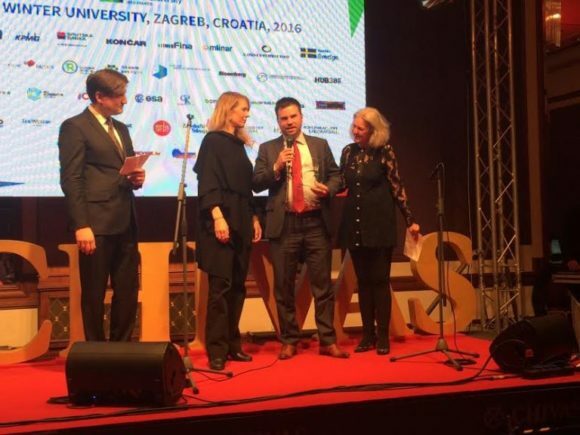 In addition to EBAN entrepreneurs, contestants from the Zagreb Connect competition also had the opportunity to pitch at the Winter University, and the winner was revealed there as well – 45HC.com took the first prize of €20,000 euros. 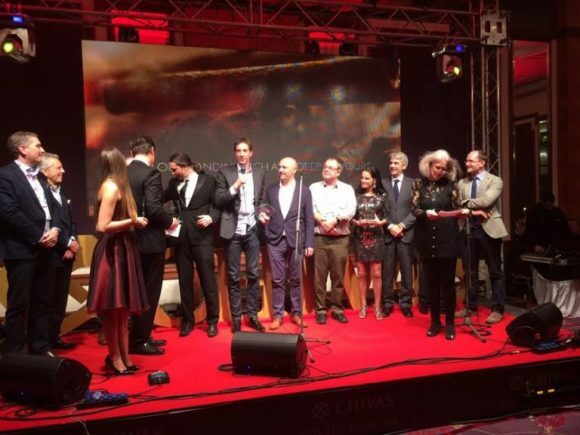 Gowaft took second place in the competition, Nanodiy – third place and Vollo received the City of Zagreb award. 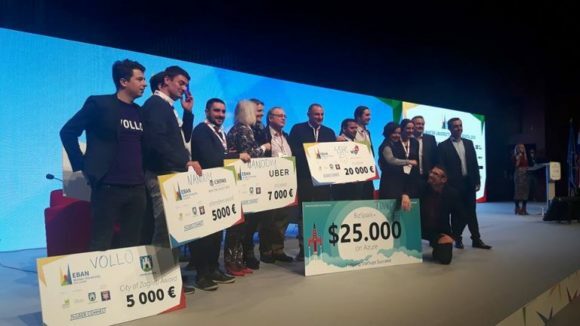 One of Zagreb Connect the startups – TinitusOFF – even received a $25,000 prize in Azure credit from Microsoft’s BizSpark. We also had the pleasure of hosting the winners of the Global Entrepreneurship Summit 2016 – Oded Ben Dov – founder of Sesame Enable and Peetachai (Neil) Dejkraisak – founder of Siam Organic, who presented their companies on stage. In addition to activities for entrepreneurs, the Training, Coaching and Demo day also had a lot to offer for investors – with training on risk mitigation for Angel Investors from EBAN President Emeritus Paulo Andrez, workshop on creating and communicating value from Cisco Entrepreneurs in Residence representatives – which was attended by entrepreneurs and investors alike – and a training for BAN Managers organized by EBAN’s partner Gust. We would like to give a special thank you to all workshop leaders and investors who took part in the Demo Day activities and inspired both entrepreneurs and investors to improve. The second day of the conference opened with a truly inspiring motivational speech from R. Michael Anderson, who, based on psychological principles, gave us an approach to better accepting ourselves, overcoming hesitation and fueling the entrepreneurial spirit. Another focus for the Winter University was impact investing, with a keynote speech from EBAN Impact Committee Chair Hedda Pahlson-Moller, who spoke about business angels, impact investment and why angels should make impact one of the criteria they use to select investments. The topic was continued with a panel featuring Serge Rollinger from the European Investment Fund, Renata Brkic from Impact Hub Professor Balthazar and, of course, Hedda. It was moderated by EBAN Impact Program Officer Cecile Sevrain. The panelists gave different perspectives on impact investing based on their own experiences working in various sectors. EBAN Winter University was also a celebration of women investing and entrepreneurship. We were proud to host the Rising Tide Europe meeting in cooperation with GoBeyond Investing and Next Wave Ventures on 28 November. On 30 November, Brigitte Baumann, Selma Prodanovic and Candace Johnson took the stage to announce Rising Tide Europe 2 – the second edition of the program which has been astonishingly successful in bringing more women to the world of angel investing. Following the Rising Tide announcement was a panel on “Open Innovation and trends in the startup industry” moderated by EBAN President Emeritus Peter Jungen with Ivan Skender from Vipnet, Laszlo Gulyas from EIT digital, Jesper Jarlbæk from Danish Business Angels, Eduardo Sanchez from ICEX Invest in Spain, and Jason Nadal from Microsoft Portugal as panelists. The panel offered interesting perspectives on the concept of open innovation and how each of the organisations represented are involved in furthering it. The conference continued with ABAN Vice President and South African BAN Founder Chris Campbell presenting “the African opportunity” speaking on why investors should focus their investments in Africa. Next up was Jason Nadal from Microsoft Portugal who gave an enlightening speech on how corporations such as Microsoft, government institutions and angel investors are collaborating to support the creation of more and better entrepreneurs in Portugal. Another inspiring speech was given by Peter Hedges from IBM Watson on how IBM is using augmented intelligence to shape the services companies provide to their customers and how Watson can be applied to different areas. Also discussed was the amazing opportunity IBM is giving startups to receive up to $120K in Cloud Credits through IBM Global Entrepreneur. The speech was followed by a panel on “Virtual Reality and Artificial Intelligence” moderated by CRANE Board Member Hrvoje Prpić, with Steve Dann from Amplified Robot joining Peter Hedges. Yoav Z. Chelouche, Managing Partner at Aviv Ventures, gave an inspiring talk on building an innovation-based society based on his experience from Israel. Serge Rollinger from the EIF took the opportunity to announce the launch of two of their most recent initiatives, the Pan European Business Angel Fund (heretofore, only nationally oriented) and the Social Entrepreneurship Impact Fund. He also participated in the next panel on “Public/private co-investment funds” which was moderated by Paulo Andrez, and featured Ivar Siimar, Chairman of ESTBAN, Ricardo Luz, Executive Board Member at IFD, Miklos Kovacs, Partner at iEurope Capital and Suresh Patel from Superfounders VC. It was also a great honor for EBAN to launch another one of its Communities at the Winter University – the CEE Community was announced with Branko Drobnak, Business Angels of Slovenia President, Panagiotis Ketikidis, HeBANCo-Founder, Ivan Jovetic, MEBAN Founder, Baybars Altuntas, TBAA President and Antal Karolyi, President of HunBAN taking the stage. The Conference wrapped up with a presentation on the dangers of crowdfunding by Hrvoje Hafner, from Crowdfunding.hr and the Finals of the Croatian junior Robotics League showcase led by Nenad Bakić from Croatian Makers League. EBAN CEE Community, including Branko Drobnak from Business Angels Slovenia and Antal Karolyi from Hungarian Business Angels. Our Gala Awards celebrated individuals and organisations who work tirelessly to improve the venture and entrepreneurial finance eco-system the world over. The honorees were: Her Excellency, Kolinda Grabar – Kitarović The President of Croatia – Visionary Leadership Award; Esther Dyson – Lifetime Achievement Award; Bruce Dickinson – Business Creativity Award; Milan Bandić, Mayor of Zagreb – Entrepreneurial City Award; Francisco de la Torre Prados, Mayor of Malaga – Most Innovative Mayor Award; Tom Yoritaka, Cisco Entrepreneur in Residence – e-Xcelerator Award; Davorin Stetner – Break the Mold Award; Dr. Alicia Robb – Global Women Investor Award; European Investment Fund – EBAN Impact Award. As well as special recognition awards to – CEE Community, Allyson Renau, Peter Cowley, Crane and ICEX. As always, we would like to thank our wonderful public and private sponsors – the European Commission, ESA, our event sponsors, ICEX – Invest in Spain, Gust, as well as our event partners for making this Congress possible. These sponsors did not just bring money but are integral parts of what EBAN is trying to achieve. And, of course, this event would not have been possible without our co-organizer CRANE and all the wonderful organizations they partnered with. Check out the pictures on the EBAN and CRANE Facebook pages, or watch videos from the event here!